Thank you! 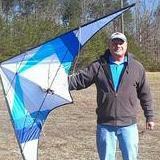 Finally in a point in my life that I can get some of these newer kites. Love the older ones I bought many years ago as well. Hope I can try both this and the Vital in April, only seen them on Facebook. Of course you can flying them both or anything I have. The Vital S is a really fun kite to fly! The Vega is large, slow and more precision oriented. However it can trick, but not as good as the Vital S.